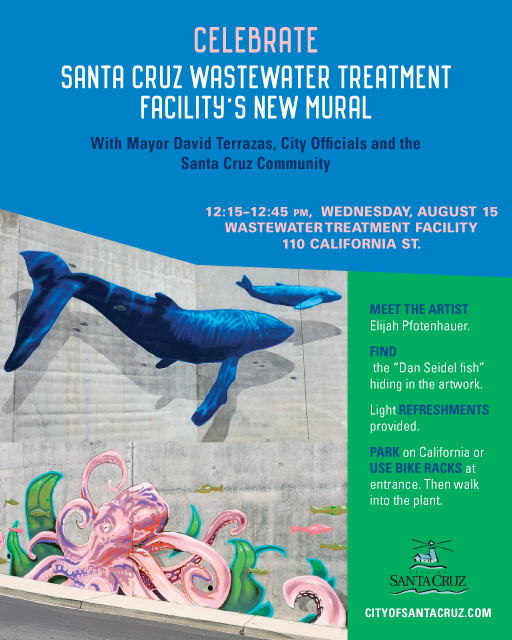 Giant blue whales, red octopus, coho and egrets will greet you at next Wednesday’s lunch-hour mural dedication with Mayor Terrazas at the award-winning Wastewater Treatment Facility. At this family-friendly event all guests will be entered into a prize raffle and light refreshments will be served. The mural includes panels covering about 400 feet of the plant’s driveway walls, extending to heights of 24 feet. 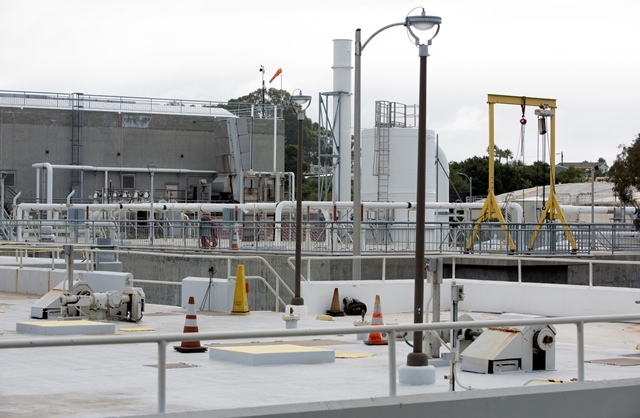 Its ocean and estuary-theme underscores the plant’s environmentally-friendly process. Learm more about how the plant provides essential quality-of-life service to the community, helps to reduce the City’s carbon footprint and protects nature in our short video. Mural artist Elijah Pfotenhauer utilizes painting and visual arts to engage and uplift the community. 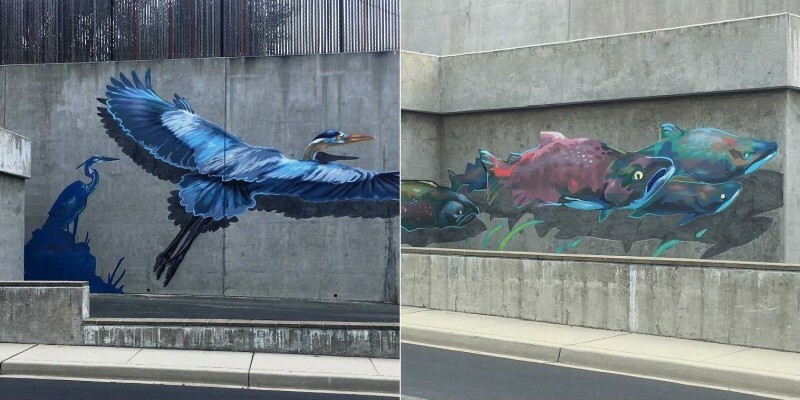 A variety of his murals have been installed throughout Santa Cruz County and the Bay Area. Limited public parking for the event is available on California Street. Biking or walking is encouraged with bike racks available at the facility’s entrance. 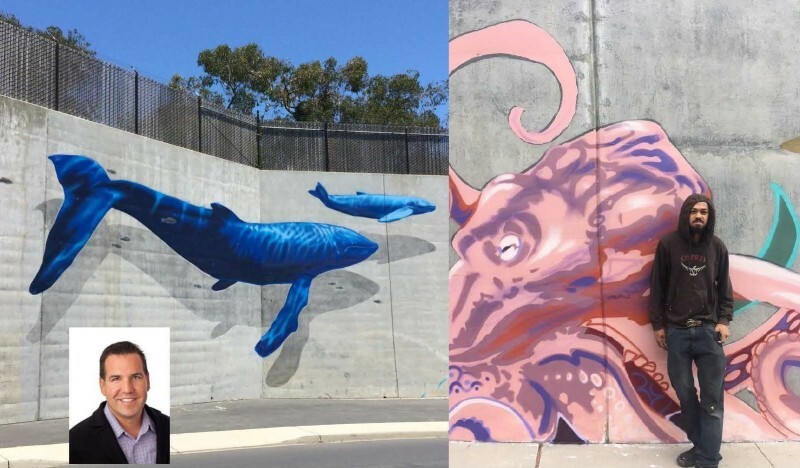 This City of Santa Cruz Arts Commission project was funded through wastewater funds from the City’s 1 Percent for Art Program. Learn and see more at the Santa Cruz City Arts blog. 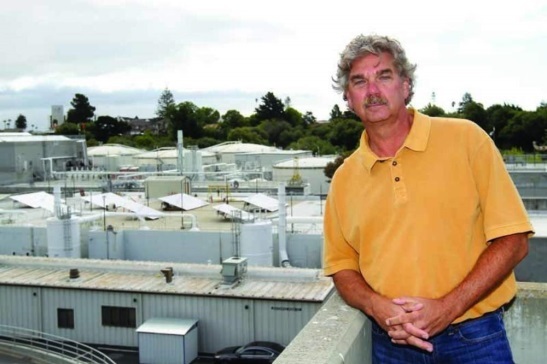 When: Wednesday, Aug. 15, 12:15-12:45 p.m.
Where: Santa Cruz Wastewater Treatment Facility 110 California St. This entry was posted in City Beat, Featured, Local Loop and tagged in art, arts council, city of santa cruz, wastewater, wastewater treatment plant. Bookmark the permalink. Next: (VIDEO) Surfing HEAVY Shorebreak with GNARLY backwash!! !